A visit to Australia offers a quick reminder of the scale to which Liquid Natural Gas (LNG) production has grown over recent years. This was a technology that first appeared in the 1960s and saw a scale up over the 1970s and 1980s to some 60 million tonnes per annum globally. 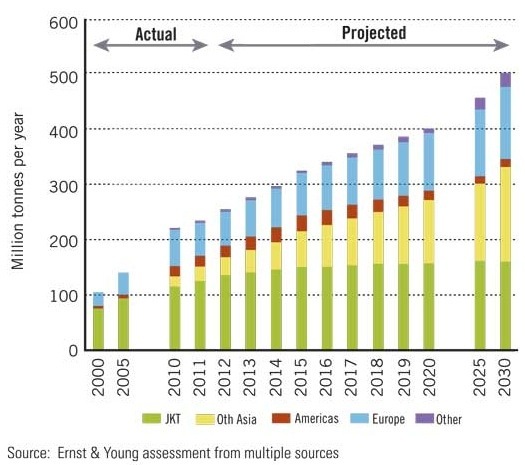 As energy demand soared in the 1990s and 2000s, LNG production quickly rose again to around 300 million tonnes per annum today and could reach 500 million tonnes per annum by 2030 (see Ernst & Young projection below). Flying into Australia we crossed the coast near Dampier in Western Australia, which is currently “Resource Central” for Australia. The waters were dotted with tankers (I counted 14 on the side of the plane I was sitting on) waiting for loading, many of which had the distinctive LNG cryogenic tanks on their decks. Two days later the first shipment of LNG from the new Papua New Guinea project took place and this received considerable coverage in the Australian media. Clearly LNG is booming in this region, with even more to come. Most major oil and gas companies have projects in development and there are several LNG “startups” considering projects. This is a great example of technology scale up, which is going to be key to resolving the climate issue by progressively shifting energy production and use to near zero emissions over the course of this century. Carbon capture and storage (CCS) is one of the technologies that needs to be part of that scale up if we are serious about net zero emissions in the latter part of the century. There are many parallels between LNG production and CCS which may offer some insight into the potential for CCS. Both require drilling, site preparation, pipelines, gas processing facilities, compression and gas transport, although LNG also includes a major cryogenic step which isn’t part of the CCS process. LNG production and CCS are both gas processing technologies so the comparison between them needs to be on a volume basis, not on a tonnes basis. CO2 has a higher molecular weight than CH4 (methane), so the processing of a million tonnes of natural gas is the same as nearly 3 million tonnes of CO2. As such, the production scale up to 500 million tonnes of LNG by 2030 could be equated to nearly 1.5 billion tonnes of CO2 per annum in CCS terms, which is a number that starts to be significant in terms of real mitigation. The actual scale up from today to 2030 is projected to be 200-250 million tonnes of LNG, which in CCS terms is about 700 million tonnes of CO2. This is both a good news and bad news story. The scale up of LNG shows that industrial expansion of a complex process involving multiple disciplines from across the oil and gas industry is entirely possible. LNG took two to three decades to reach 100 million tonnes, but less than ten years to repeat this. In the following ten years (2010-2020) production should nearly double again with an additional 200 million tonnes of capacity added. These latter rates of scale up are what we need now for technologies such as CCS, but we are clearly languishing in the early stages of deployment, with just a few million tonnes of production (if that) being added each year. What is missing for CCS is the strong commercial impetus that LNG has seen over the last fifteen years as global energy demand shot up. With most, if not all, of the technologies needed for CCS already widely available in the oil and gas industry, it may be possible to shorten the initial early deployment stage which can last 20 years (as it did for LNG). If this could be achieved, CCS deployment at rates of a billion tonnes per decade, for starters, may be possible. This is the minimum scale needed for mitigation that will make a tangible difference to the task ahead. The commercial case for CCS rests with government through mechanisms such as carbon pricing underpinned by a robust global deal on mitigation. That of course is another story.